The Cold War, a contest between antithetical ideologies, democratic capitalism and Soviet socialism, emerged shortly after World War II and dominated global politics for the latter half of the twentieth century. Its origins, however, go back to the late nineteenth century when the United States decried Russia's colonial claims on the Manchurian region of China. In the early twentieth century, opposition stiffened further over Russia's brutal pogroms against its Jewish citizens. The Bolshevik cooptation of the peasant revolution against the Russian Czar in 1917, and their subsequent creation of the Soviet state, heightened mutual suspicion and opened the gulf between Russia and the West. World War II brought a temporary reprieve in animosities, but tensions reemerged over questions concerning the postwar world. President Harry Truman, successor to Franklin Delano Roosevelt, launched the first blow in the Cold War by insisting that Russia honor its prewar commitment to self-determination under the Atlantic Charter, and permit a democratic government in Poland. Soviet leader Joseph Stalin steadfastly refused any concession, and the Polish issue became the first beachhead in Cold War politics. The Polish crisis alarmed American leaders who interpreted it as confirmation that Russia intended to carry the Bolshevik revolution westward. The thaw caused great anxiety in the United States as it turned to the Pacific theater and planned the settlement of Germany. Each situation loomed ominously with the prospect of an entrenched Soviet presence clouding negotiations. These fears compelled Truman to end the Japanese campaign as swiftly as possible. The administration made the decision to deploy the world's first atomic bomb with both the unyielding Japanese and intransigent Russians in mind. Once the Japanese surrendered in the summer of 1945, the Cold War began in earnest. In almost rapid succession, the threat of Communist infiltration troubled Truman. The war left many nations, particularly those in the Third World, vulnerable to Communist influence. Additionally, a few countries, most notably China, erupted in civil war between Capitalist and Communist factions at the close of World War II. The loss of China's vast natural resources, unlimited commercial potential, and immense population concerned American policymakers, who had supported the ultra-nationalist Chiang Kai Shek from the conflict's inception. To Truman's dismay, Communist leader Mao Tse Tung's made significant strides in battles as early as 1946 and gained the upper hand permanently, forcing Chiang off the mainland to the neighboring island of Taiwan, in 1949. Simultaneous to the Chinese civil war were political fluctuations in the Middle East. The Soviet schemes on making Iran, Turkey, and Greece strategic footholds in the Mediterranean compelled Truman to take a tough stance. In 1946, America funneled well over $600 million in appropriations to democratic forces battling the Communist led and funded National Liberation Front in Greece for control in the upcoming national elections. While in Iran and Turkey, Truman met Soviet incursions through the newly formed United Nations and with the threat of American military reprisal. George F. Kennan, charge d'affaires in Russia, provided a rationalization for the events of 1946 in his alarm driven 8000 word dispatch from Moscow on the Soviet postwar intentions. Providing the first part in what became the intellectual mooring of the Cold War, his long telegram depicted Russia as irretrievably expansionist and guided by messianic ideology that the United States to resist. Truman read the events in the Mediterranean through Kennan's lens and assumed it justified a spirited response, even though Truman had made no official declaration of a "cold war" to this point. Stalin and Churchill had already made their Cold War declarations early in 1946, ruman rendered his own salvo in March 1947. The Truman Doctrine argued that the world's future was split between totalitarianism and democracy. To preserve the American way of life, they would have to respond to Communist-inspired uprisings anywhere in the world. Funding the democratic forces in Greece was the first manifestation of this task; next, Truman requested a larger economic stimulus program for Western Europe that might rescue them from Communist subversion. His request became the European Recovery Program, or Marshall Plan, which the administration intended to supplement with the International Monetary Fund and the World Bank created at the Bretton Woods Conference of 1944. Next, Truman created the North Atlantic Treaty Organization (NATO), a vast military alliance premised upon multilateral response to Communist attack. The Marshall Plan and NATO gave Truman the tools for fighting the Cold War and promoting democratic capitalism in the Third World. 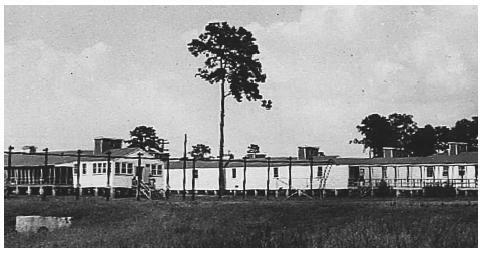 Training Center One, a secret CIA guerrilla warfare training base at Ft. Benning, Georgia, in 1951, where some menbers of the Air Supply and Comminucation Service (ARC) trained before going overseas. China had discovered that the newly created Central Intelligence Agency and the Air Force were collaborating on a new Cold War weapon, an "unconventional warfare" group whose connection to the CIA remains an official government secret. California Congressman Richard M. Nixon, who defined themselves as Cold War activists. Republicans accused the Democratic Party with compromising America's postwar ambitions, giving Russia advantage in Western Europe. The capture of Russian spy of Klaus Fuchs in Great Britain, and then American counterparts Ethel and Julius Rosenberg, convicted for selling atomic secrets to the Soviet Union, along with the Alger Hiss case, validated Republican claims for many. Further proof came with the Soviet detonation of a nuclear device in 1949, and victory of Mao Tse Tung in China. George Kennan again proved a useful guide for Truman with his Foreign Affairs article published July 1947 under the pseudonym Mister X. In the X Article, titled "The Sources of Soviet Conduct," Kennan warned that Russia operated on a mechanistic and fanatical faith that America had to meet wherever possible. The Soviet system, he advised, suffered from internal contradictions that would destroy it from within if given exposure. Truman and his secretary of state, Dean Acheson, interpreted Kennan's argument as "containment" and constructed the domestic tools for its execution. That July, Truman presented Congress with the National Security Act, which restructured the military establishment creating the Department of Defense, the National Security Council, and the CIA. Soon thereafter, he created loyalty policies aimed at rooting out Communists in the government. The preemptory steps were not enough to meet the myriad strategic and political crises of the Cold War; therefore the administration attempted to streamline America's response even more with the creation of National Security Council Memorandum (NSC) 68. As the top-secret blueprint for fighting the Cold War, NSC 68 called for a massive increase in military appropriations, the creation of the enormously more powerful hydrogen bomb, and levying taxes on the American public to pay for the program. Congress was reluctant to appropriate the sums of money needed for the Cold War, so Truman needed a dramatic event to shake them from their parochialism. That event came when North Korea, a Communist nation, crossed 38th parallel and invaded its democratic counterpart South Korea on June 24, 1950. The Korean conflict proved to be a double-edged sword for Truman; it provided him the public mandate to institutionalize the Cold War, but it also laid the seeds for the political undoing of the Democratic Party. The battle itself swung unevenly, with the North Koreans at first advancing southward, and then United Nations forces led by General Douglass MacArthur recapturing ground. The turning point in the conflict occurred when a "volunteer" force from China crossed the river separating Korea and China, and sent MacArthur's forces into retreat. The Chinese attack threatened war, but Truman decided to quell to situation for the sake of American lives and global peace. His decision placed him at odds with MacArthur, which resulted in a war of words that ended with Truman unceremoniously removing the general from his command. 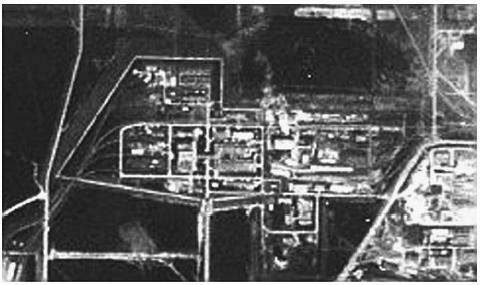 An electromagnetic separation facility in Sverdlovsk, Russia, used for uranium enrichment, is shown in an undated high-altitude photograph taken during the Cold War. Many of the spy photos made of the Soviet Union taken in the urgent context of the Cold War now aid in peaceful purposes, such as disarmament verification. war against the Vietnamese. Additionally, he created a military alliance for East Asia, the Australia, New Zealand, and United States (ANZUS) pact, and began rearming Germany as a buffer to Soviet advances west. Domestic politics could not escape the gravitational pull of the Cold War, and its questions particularly burdened the presidential election of 1952. Red-baiters in the Republican Party, most notably Wisconsin Senator Joseph McCarthy, created such a relentless and fantastic attack on Truman's handling that it implicated the entire Democratic Party. The Republican candidate, Dwight Eisenhower (referred to as Ike), stayed above the fray, and allowed his reputation as the great general of World War II's European theater to win him the White House. Eisenhower took a pragmatic approach to the Cold War, and established the tradition that would remain in place until its end. The death of Soviet Premier Joseph Stalin in March 1953 cast a shroud of uncertainty over Eisenhower's first year as president. Undeterred, however, he began defusing the anxious economy and international policies that dominated Truman's administration, with his "New Look" program. The New Look consisted of nuclear deterrence, designated by what his secretary of state John Foster Dulles called brinksmanship, massive relation, nation building in the Third World, the diffusion of American culture internationally, and a heavy investment in technological innovation. Eisenhower detested wasteful spending and thought a combination of brinksmanship, technological innovation, and massive retaliation would streamline the military, yet preserve the nation's ability to respond quickly to crisis. Eisenhower gauged success in the Cold War effort broadly, thereby making the household washing machine as important in the Cold War arsenal as the B-52. In 1959, this correlation sparked the famous "kitchen debate" between Vice President Richard Nixon and Soviet Premier Nikita Khrushchev at the American National Exhibition in Moscow over which political economy promoted the better home life. As Eisenhower eschewed Truman's containment program for a policy of rolling back Communist expansion, reducing the size of conventional forces meant that the administration had to rely on the CIA to keep order in the Third World through counterintelligence and espionage. 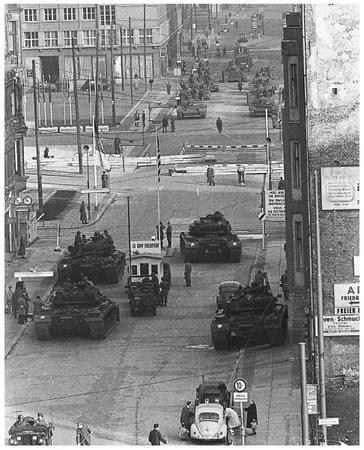 U.S. Army tanks at Checkpoint Charlie, foreground, face Soviet Army tanks in 1961 during the most dangerous of several crises at the Friedrichstrasse checkpoint in Berlin during the Cold War. Cold War politics and market concerns became a signature attribute of the New Look. The Tachen Straits crisis presented a different problem. In 1954, mainland China began shelling two of the islands that neighbored Chiang Kai-Shek's Taiwan, Matsu and Quemoy with the threat that it was the start of a full-scale invasion to repatriate it citizens. To the surprise of the entire world, Eisenhower threatened the use of nuclear weapons to defend Taiwan unless China stopped the bombardment. Frightened by the possibility of nuclear calamity, neighboring countries India and Pakistan pressured China to desist, and the Tachen Straits crisis came to an uneasy end. The conflict, however, was a coarse example of brinksmanship and a precursor to America's deepening involvement in East Asia under the auspices of the "domino theory" of foreign policy. The image of Asian democracies, falling like dominos in rapid succession to nationalist or Communist infiltration, justified a greater presence in conflict between France and Vietnam. Vietnam became a crisis for the United States at the Geneva Conference of 1954, when it was learned the French were on the verge of collapse in the region, signified by their surrender at Dienbienphu. To preserve democracy in Southeast Asia, the United States urged the division of Vietnam at the 17th parallel on the promise the country would have open elections within two years. In an attempt to thwart a potential Communist takeover in the upcoming elections, America installed Ngo Dinh Diem as South Vietnam's prime minister. Additionally, Eisenhower created a regional defense apparatus, the Southeast Asian Treaty Organization (SEATO), modeled after NATO, to protect the new nation as it bloomed into an independent state. Diem was an archconservative with autocratic tendencies who soon declared South Vietnam an independent state and cancelled the scheduled national elections. The United States supplemented Diem with vast amounts of capital, goods, machinery, weaponry, and advisors to train his soldiers. This effort marked the nation-building phase of the Cold War. The decision to build a nation as a response to what was essentially a civil war, committed the United States to the success and failure of South Vietnam, and would have dire consequences for America's place in the Cold War. The Middle East became bothersome for Eisenhower in the later years of his administration, forcing him to make his own Cold War declaration in 1957. Egyptian president, Gamal Nassar created the Baghdad Pact, a military alliance between Egypt, Iraq, Iran, Pakistan, and Turkey in 1955 with the belief they could exploit the Cold War division for the benefit of Arab and Muslim nations. As part of his "middle road" strategy, Nassar opened relations with communist nations, Czechoslovakia and China, which soured America's attitude toward Egypt and compelled Dulles to cancel funds for the Aswan hydroelectric dam. Nassar responded by nationalizing the Suez Canal and assuming control of the oil traveling into the Mediterranean from the East. The situation escalated when Israel attacked Egypt over disputed territory, and Great Britain and France took that as an opening to seize the Suez Canal. The conflict placed the world oil trade and Middle Eastern stability in jeopardy, and forced Eisenhower to pressure the European nations to relinquish control of the canal. Although resolved, the specter of Soviet influence in the oil-bearing region forced Eisenhower to take a stronger stand in the Middle East. The concern culminated in the "Eisenhower Doctrine," which held that the United States defend any Middle Eastern nation against communism. Eisenhower invoked the doctrine only twice, in the Jordanian uprising that spring and Lebanon in 1958, but it set precedence for future presidents Lyndon Johnson, Richard Nixon, and Jimmy Carter. By the end of his term as president, Eisenhower faced ironic opposition. His administration privileged modernization, and ended under the suspicion of technological backwardness. Eisenhower created the National Aeronautics and Space Administration (NASA), and began America's reach for the heavens. The Russian launch of Sputnik, the unmanned satellite in late 1957, and the downing of the American U2 surveillance plane in 1960, demanded a greater investment in science and technology. John F. Kennedy drew upon this anxiety when he argued that America lagged behind the Soviet Union in missile production. The Missile Gap critique helped Kennedy capture the White House, but it also placed unrealistic burdens on the way he and his successor Lyndon B. Johnson conducted the Cold War. In the 1960s, the Vietnam conflict pervaded America's Cold War politics. The decade began with President Kennedy suffering profound Cold War failures, the failed attempted overthrow of Cuba's Communist leader Fidel Castro at the Bay of Pigs, the CIA-sponsored assassination of Congolese Prime Minister Patrice Lumumba, the Cuban Missile Crisis, and the construction of the Berlin Wall. Needing to silence critics, Kennedy decided to take a more rigid stand against the Communists in South Vietnam. With Diem's popularity at a nadir due to his oppressive policies, Kennedy signed off on a plan to depose him. During the junta, however, the operatives assassinated Diem, foreshadowing Kennedy's own murder three weeks later. When Lyndon B. Johnson assumed the presidency, he inherited the burden of not losing the Cold War in Vietnam. Weighted by fluctuations in the civil rights movement and burgeoning antiwar sentiment, Johnson accelerated both nation building in South Vietnam and military resistance to Communists. The entire conflict, and to some degree American prestige, came crashing to the ground in 1968 when Communist forces launched a massive attack against American and South Vietnamese forces in the major cities. Although the siege only had temporary success, it had a leveling effect on domestic sentiment. Cold War arguments carried less significance and the trouble became finding a way out. That responsibility fell to Richard Nixon who inherited the Vietnam and the Cold War in 1969. In the midst of the conflict, Nixon and his secretary of state, Henry Kissinger, began to redefine the Cold War into a mutual understanding of the boundaries between the U.S. and Russia. He coupled this with the Nixon Doctrine, which held that America would relinquish some of its military commitments. Breaking precedent, Nixon went to China and began arms reduction talks, or détente, with the Russians. To counter his critics, Nixon coupled détente with a brinkmanship-like tactic he called the "mad man theory." According to this strategy, American allies would warn Third World nationalists that Nixon was insane and willing to use nuclear weapons to end disputes. The crazy man tactic had little to no effect on its intended audience, North Vietnam, or any of the other Cold War dissidents. Nixon's Strategic Arms Limitation Talks (SALT I), begun in 1969 and concluded May 1972, between the United States and Brezhnev regime exemplified the spirit his doctrine. While SALT I failed to reduce the creation and stockpiling of new, more destructive weapons, it was a progressive gesture toward an international dialogue on nuclear weapons. Buoyed by the apparent success of détente and the belief that China could help end the war in Vietnam, Nixon went into the presidential election of 1972 confident in his Cold War program. Indeed, twenty-five years had shifted the Cold War from security concerns, to a contest of development, to Nixon's program of limited contact, and ended the 1960s with the possibility of an uneasy coexistence between Soviet socialism and democratic capitalism. Many questions were still unanswered regarding the conflict in Vietnam, rising nationalism in the Middle East, the global economy, domestic dissent, and nuclear control. These issues would dominate the last seventeen years of the Cold War. Gaddis, John Lewis. We Now Know: Rethinking Cold War History. Oxford University Press, 1998. La Feber, Walter. America, Russia, and the Cold War. McGraw-Hill Humanities, 2001. McDougall, Walter. The Heavens and the Earth: A Political History of the Space Race. Baltimore: Johns Hopkins University Press, 1997. McMahon, Rober. The Cold War on the Periphery. New York, Columbia University Press, 1994. Wagnleitner, Reinhold. Cocacolonization and the Cold War. Chapel Hill, The University of North Carolina Press, 1997. Frank Costigliola, "Unceasing Penetration": Gender, Pathology, and Emotion in George Kennan's Formation of the Cold War." Journal of American History 83 (March, 1997): 1309–1939.